Aquatica’s True Ofuro Mini Japanese soaking tub was designed in response to customers' requests for an even smaller version of True Ofuro soaker tub! 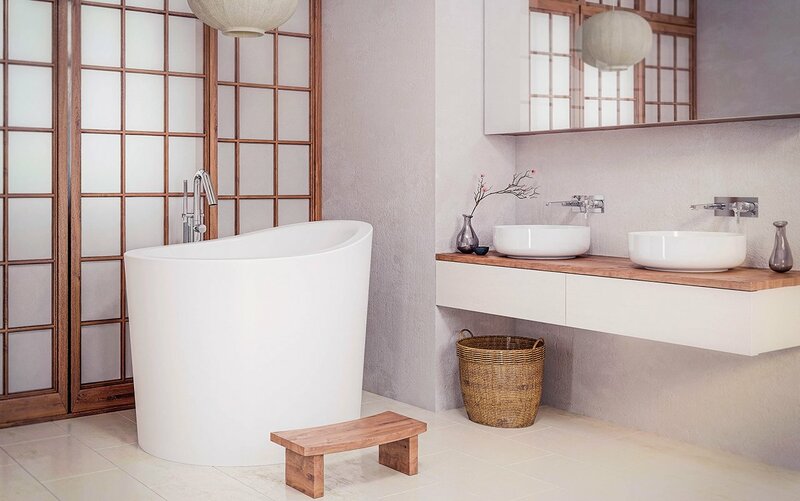 This modern interpretation of an ancient Japanese bathing tradition is crafted in Italy from the brand's signature AquateX™ solid surface material. Its space-conscious footprint of 43" x 43" (1090mm x1090mm) makes it an ideal option for condos and small bathrooms, while its tall design provides a deep, full-body soak. True Ofuro Mini features a slightly elevated rim for improved neck and head support, as well as an ergonomic built in seat, allowing the body to be comfortably emerged to maximum water capacity. Optional teak wood step available for easier access into the tub.